A Yurt, or Ger in Mongolia, is a portable, felt-covered, wood lattice-framed dwelling structure traditionally used by nomads in the steppes of Central Asia. The Yaranga, used by peoples in the Northern parts of Russia, is a similar form of shelter. A yurt is quite different from a modern tent, apart from its portability—the structure packs up small enough to fit on one draft animal and can be set up easily by the family who inhabits it. The design has been developed for generations to suit the needs and environment of its inhabitants. Traditional structures can be warm in winter cold, yet cool in summer. The circular shape is most efficient in terms of heating because it leaves the least amount of exterior surface exposed to the elements, and also offers low wind resistance, making it resilient in stormy weather. 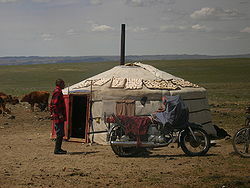 Mongols live in their gers year round as their permanent homes, finding them the most practical and efficient form of housing. The yurt is not just a simple form of housing used in less-developed societies. In the twentieth century a number of designs were developed for yurts in North America. Some versions are made of wood and set on permanent foundations, unlike the original portable structures. Others are light and portable, easy to erect, and versatile in use. The different variations retain the essential characteristics, the circular shape and the roof construction, creating an open, airy space. Such structures have been found conducive to healing and spiritual practices, encouraging a sense of community as well as a sense of well-being and wholeness. In all these creative variations, modern yurts and yurt derivatives have become valuable resources throughout the contemporary world. 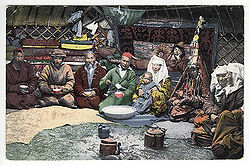 Turkmen woman at the entrance to a yurt in Turkestan; 1913 picture by Prokudin-Gorskii. Nomads in the inhospitable regions of the world had no chance to settle and develop agriculture. The steppes and tundras are cold, windswept, and barren. To survive, they developed shelters that were close to nature and supported the necessities of human life. The yurt and similar structures are "perfect lessons in appropriate design and sustainable building. Refined over generations, they are simple yet sophisticated, beautiful, and comfortable" (Pearson 2001). The word yurt is originally from the Turkic word meaning "dwelling place" in the sense of "homeland;" the term came to be used in reference to the physical tent-like structures only in other languages. In Russian the structure is called yurta (юрта), whence the word came into English. In Kazakh (and Uyghur) the term for the structure is kiyiz üy (киіз үй, lit. "felt home"). In Kyrgyz the term is boz üý (боз үй), literally "grey house," because of the color of the felt used in its construction. In Mongolian it is called a ger (гэр). Afghans call them "Kherga"/"Jirga" or "ooee." In Pakistan it is also known as gher (گھر). In Hindi, it is called ghar (घर). The original word for nomad came from a word for felt, making them the "felt people" (Kemery 2006). The similarly structured Yaranga is a traditional mobile home of some nomadic Chukchi and Siberian Yupik in the Northern part of Russia. The word yaranga comes from the Chukchi language. In Russian use, the terms chum (a tent-like structure similar to Native American tipis used by Nenets people in Russia), yurt, and yaranga may be used indiscriminately. Early people living in harsh climates developed their yurts from the materials available to them. Their sheep's wool was worked into felt mats which were tied to the roof and walls, made from saplings, with ropes made from animal hair. Extra mats could be added in winter for additional warmth; they could be removed in summer to allow airflow in hot weather (Kemery 2006). Traditional yurts consist of a circular wooden frame carrying a felt cover. The felt is made from the wool of the flocks of sheep that accompany the pastoralists. The timber to make the external structure is not to be found on the treeless steppes, and must be traded for in the valleys below. Out of necessity, the yurt was designed to be dismantled easily and the parts carried on camels or yaks to be rebuilt on another site. The frame consists of one or more lattice wall-sections, a door-frame, roof poles and a crown. Some styles of yurt have one or more columns to support the crown. The (self-supporting) wood frame is covered with pieces of felt. Depending on availability, the felt is additionally covered with canvas and/or sun-covers. The frame is held together with one or more ropes or ribbons. The structure is kept under compression by the weight of the covers, sometimes supplemented by a heavy weight hung from the center of the roof. They vary regionally, with straight or bent roof-poles, different sizes, and relative weight. Generally, though, erecting a yurt requires little skill or tools and can be done relatively quickly by its owners. 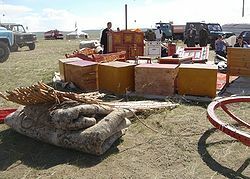 Disassembled yurt in Tos-Bulak with the interior furniture visible. The yurt is distinguished by its unique roof construction. The wood frame consists of long spans that have no immediate support, creating an open, airy space and the hole or skylight in the center of the roof allows sunlight to enter. The roof poles meet in a center ring which holds them in a state of compression; gravity pushes them downward and inward. Where they meet the wall, there is a natural outward thrust. A band of rope (or wire cable in modern versions) holds the poles in tension against this outward pressure. As a result of the combination of these forces, no internal supports are needed, giving the yurt a feeling of great spaciousness. This design is also very resilient and can withstand the forces of nature, including strong winds, heavy snow, and even earthquakes (Kemery 2006). The circular design of the yurt is perfect for nomadic lifestyles, encompassing the maximum amount of internal space for the amount of materials used to construct it. It also leaves the least amount of exterior surface exposed to the elements, making it the most efficient to heat and offering low wind resistance (Kemery 2006). Modern fabric-covered yurts are simple to construct with a few common wood-working tools. They are easy to erect and the most basic, portable versions can be taken down in an hour. They are also low-impact causing no permanent damage to the land on which they are erected (King 2002). Mongolian yurt: the sign says (roughly) "Food, Fast food restaurant, General store"
For centuries, people throughout Central Asia used yurts as their homes. They are cool in summer and are easily warmed in winter with a stove. Humanitarian aid organizations provide yurts to families suffering from inadequate shelter due to extreme poverty. A ger protects a family in Mongolia from the cold temperatures and icy winds that whip across their barren homeland better than western-style rectangular shacks (World Vision 2008). The yurt is a gift, an ancient nomadic shelter only recently available to modern culture. Versatile, beautiful and spiritual, both ancient and contemporary versions provide an option for shelter that is affordable, accessible and gentle to the earth. 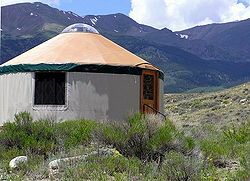 By its very existence, the yurt calls forth life in simplicity, in community, and in harmony with the planet (Kemery 2006). The healing, creative, communal, and spiritual nature of the yurt lends itself to use in the healing arts, retreat centers, spiritual practices such as meditation, as well as community gatherings. The embrace of the round space gives a sense of well-being and wholeness. Bringing people together in a circle fosters connection and equality (Kemery 2006). The wooden lattice crown of the yurt, the shangrak (Mongolian: тооно, toono; Kazakh: Шаңырақ, shangyraq; Kyrgyz: түндүк, tunduk) is itself emblematic in many Central Asian cultures. 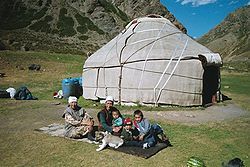 In old Kazakh communities, the yurt itself would often be repaired and rebuilt, but the shangrak would remain intact, passed from father to son upon the father's death. A family's length of heritage could be measured by the accumulation of stains on the shangrak from generations of smoke passing through it. A stylized version of the crown is in the center of the emblem of Kazakhstan, and forms the main image on the flag of Kyrgyzstan. The ger is more than just a means of shelter for Mongolian tribes. They are sacred places, expressing the world views of people living in close connection with the cycles of life. Beyond the practical values of the circular form, those who make yurts their home regard their circular dwellings as representing the "universe in microcosm: the floor (Earth), the roof (sky), and the hole in the roof (the sun)" (Pearson 2001). 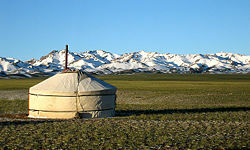 The traditional yurt or ger continues to be used in many parts of Central Asia and northern Europe. Additionally, enthusiasts in other countries have taken the visual idea of the yurt—a round, semi-permanent tent—and have adapted it to their cultural needs. The yaranga is a tent-like traditional mobile home of some nomadic Northern indigenous peoples of Russia, such as the Chukchi and Siberian Yupik. Its outer appearance is similar to the yurts and gers of Central Asia, but the inside is structured somewhat differently. The Chukchi yarangas are built of a light wooden frame, cone-shaped or rounded, and covered with reindeer hides sewn together. A medium-size yaranga requires about 50 skins, with as many as 80 being used for larger sizes. A large yaranga is hard to heat completely in winter; there is a smaller cabin, a polog, built inside, that can be kept warm where people sleep (Dinets 2006). The Chaplino Eskimos (Ungazighmiit), Siberian Yupik peoples, also use yarangas for winter. They have a framework made of posts and covered with canvas (Рубцова 1954: 515) The yaranga is surrounded by sod or planking at the lower part. There is a smaller cabin inside at the back, used for sleeping and living, separated from the outer, cooler parts of the yaranga with haired reindeer skins and grass supported by a cage-like framework. The household work is done in the main section of the yaranga in front of this inner building, and many household utensils are kept there; during winter storms and at night the dogs are also there (Рубцова 1954: 100–101). A ger in south Mongolia, Gobi. With Aruul (dried curds) on the roof. The roof poles of Mongolian gers are straight, with separate poles for the walls. A tono or central ring for the roof is carefully crafted by a skilled artisan and very heavy, often requiring supports, bagana (Kemery 2006). The doors to the ger are heavy and made of wood. They are considered a symbol of status (Kemery 2006). For Mongolians, a ger is not just a shelter it represents their whole world view. The floor is based on the four directions: The door opens to the south; the sacred space is opposite the door to the north; the western half is the yang or masculine area with men's possessions (hunting and riding gear) and seating for the men; the eastern side is the yin or feminine area for the women and their household equipment. The ger holds the balance and flow of yang and yin, of the worlds above and below, centered around the sacred fire in a circle that balances all aspects of life (Kemery 2006). The Turkic yurts are constructed from bent poles that serve both as walls and roof. The roof ring is light and simple to make, requiring no additional support. 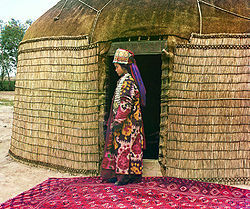 Turkic yurts may have double doors that open inward, but more commonly the doorways are covered with colorful flaps or felt or rugs. These are artistic creations with beautiful designs appliqued on them (Kemery 2006). In the United States and Canada, yurts are made using modern materials. They are highly engineered and built for extreme weather conditions. In addition, erecting one can take days and they are not intended to be moved often. Often the designs of these North American yurts barely resemble the originals; they are better named yurt derivations, because they are no longer round felt homes that are easy to mount, dismount, and transport. There are three North American variants, the portable fabric yurt, the tapered wall yurt created by Bill Coperthwaite, and the frame panel yurt designed by David Raitt (Kemery 2006). The latter two forms are made of wood and set on permanent foundations, unlike the original portable structures. North American yurts and yurt derivations were pioneered by William Coperthwaite in the 1960s, after he was inspired to build them by an article about Supreme Court Justice William O. Douglas's visit to Mongolia (Kemery 2001). The photographs of Mongolian gers inspired him and he began designing wooden yurts. Over the years he became involved in hundreds of educational and community projects involving the building of yurts. One of Coperthwaite's students David Raitt, also went on to pursue yurt design and building (Raitt 2006). Another of Coperthwaite's students, Chuck Cox, built a canvas-covered yurt as a student project at Cornell University. His subsequent designs became the basis of canvas yurt design that became popular throughout North America (Kemery 2006). Different groups and individuals use yurts for a variety of purposes, from full-time housing to school rooms, offices, shops, and studios. In some provincial parks in Canada, and state parks in several U.S. states, permanent yurts are available for camping. Yurts have also been used to house migrant workers in Napa Valley, California. Despite their variations, or perhaps in part because of them, modern yurts and yurt derivatives have become valuable resources throughout the contemporary world. Dinets, Vladimir. 2006. Chukchi art. Vladimir Dinets Homepage. Retrieved November 18, 2008. Kemery, Becky. 2001. Yurts—Round and Unbound. Alternatives Magazine 18. Retrieved November 16, 2008. Kemery, Becky. 2006. Yurts: Living in the Round. Gibbs Smith, Publisher. ISBN 978-1586858919. King, Paul. 2002. The Complete Yurt Handbook. Eco-Logic Books. ISBN 1899233083. Kuehn, Dan Frank. 2006. Mongolian Cloud Houses: How to Make a Yurt and Live Comfortably. Shelter Publications. ISBN 978-0936070391. Pearson, David. 2001. Circle Houses: Yurts, Tipis and Benders (The House That Jack Built). Chelsea Green. ISBN 1890132861. Raitt, David. 2006. History. Vital Designs. Retrieved November 16, 2008. Рубцова (Rubcova), Е. С. 1954. Материалы по языку и фольклору эскимосов (чаплинский диалект) (Materials on the Language and Folklore of the Eskimos, Vol. I: Chaplino Dialect). Москва: Российская академия наук (Moscow: Russian Academy of Sciences). All links retrieved August 29, 2014. This page was last modified on 29 August 2014, at 16:05.